If there is such a thing as a moment, the social enterprise movement is experiencing it right now. This approach has become very popular in the non-profit world, especially among millennials seeking to create employment training opportunities. 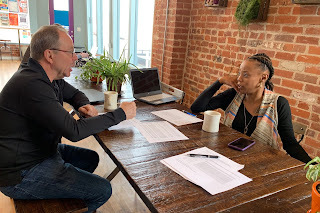 Almost every week someone contacts us here at Belay Enterprises wanting to learn about our model as they develop their own start-up social venture. In the rush of enthusiasm for social enterprise, potential practitioners often overlook how hard it is to start and sustain such projects. I spend a lot of time encouraging people in the non-profit sector to start taking risks because the sector often is biased against such action because of its funding model. Leaders don't want to disappoint donors because a project didn't work out. But organizations need to take risks in order to achieve growth in social enterprise. In addition, sustaining such a project can be equally difficult. Ventures that survive the start-up phase often require serious talent and expertise to maintain sustainability. And then to grow, they need significant investment. This difficult reality is one reason why some social enterprise leaders question its ability to ever address the employment training needs of people rebuilding lives. I argue there is real value, especially for faith-based organizations, to focus their efforts instead of going for scale. But another way out of this dilemma is to embrace both the difficult nature of social enterprise and the fact that for-profit businesses are better equipped at creating job opportunities. A social enterprise's chief contribution is its ability to effectively employ and train individuals with significant challenges to employability. If a nonprofit can partner its unique value with for-profit businesses with hiring needs, this is an extremely effective way to achieve scale and significant-training opportunities. A non-profit contract labor service has the potential to open up training opportunities for individuals like ex-offenders that some companies are hesitant to directly hire. But the support and training of the non-profit enterprise combined with the real job opportunity at the for-profit business offers benefits for both the employee and the employer. Contract labor ventures may not be as exciting as other social enterprise start-ups, but I think they offer a real opportunity to create significant jobs for people rebuilding lives.